Here we are at the end of December and it is shaping up to be a classic New England winter -- COLD and SNOWY! With well over a foot on the ground already, we now have a great base of snow for everyone to enjoy the outdoors. From skiing to ice skating to snowshoeing to ice fishing, go outside and have some fun! 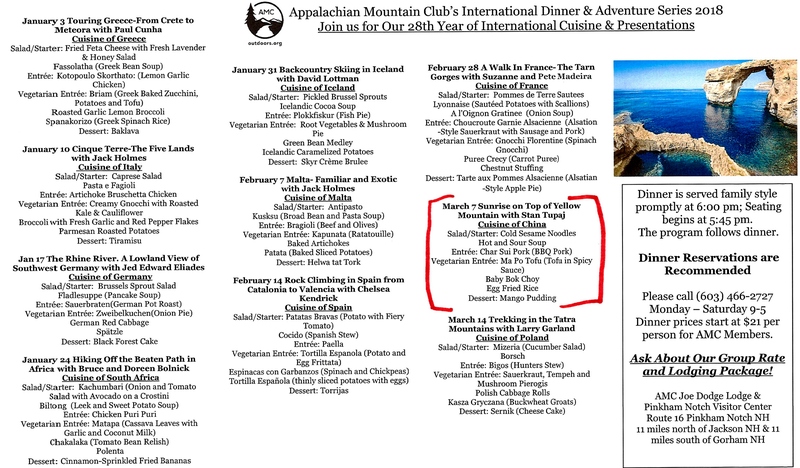 Starting Wednesday January 3rd, the Appalachian Mountain Club kicks off its 28th year of hosting the International Dinner and Adventure Series. Each week there will be a different four-course menu related to that evening's country. The meal is followed by a presentation (by local and regional guides, explorers and travelers), with photos, that detail a visit to a far-away place. Responsible BYOB is welcome! What better way to enjoy a winter evening with good food and information about exotic places? Take special note of the presentation for March 7th! "Cuisine of China, followed by SUNRISE ON TOP OF YELLOW MOUNTAIN with Stan Tupaj!" 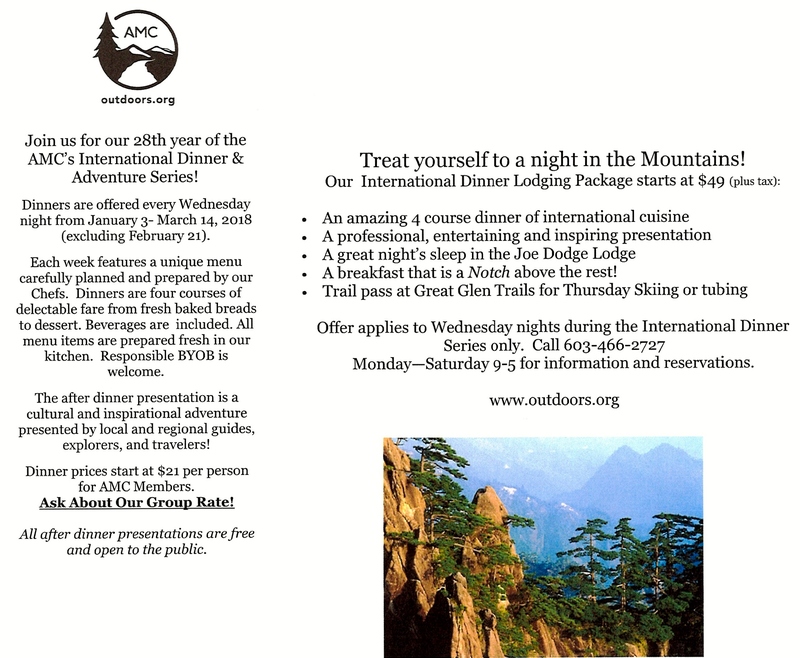 Dinners are $21 for AMC members and $24 for non-members (group rates also available). The programs are free and open to the public. A Thursday Skiing or Tubing package at Great Glen Trails! All for $49. Call 603-466-2727 Monday-Saturday between 9 & 5 and mention the International Dinner Series Special. The 2018 Kezar Realty calendars have arrived and they are now available for pick-up at our office and in stores all around town. Not in Lovell? Send me an email (stan@fairpoint.net) and I will be sure to send one (or two) in the mail. Now I ask, what better way to dress up your fridge? * Lots to choose from at the HARVEST GOLD GALLERY in Center Lovell. Custom designed earrings, bracelets, necklaces, rings and more. Inside their large gallery is a wide variety of American-made art work (much of it local) that will brighten every home. Bill and Lynda can be reached at 207-925-6502.Visit their website here. * You need to check out the great things that Brent Legere is creating at the LOVELL BOX COMPANY. Wonderful, one-of-a kind boxes and creates made from pine grown on the family land. Perfect for wine, beer, storage, produce, etc. Brent would be happy to make something from your own specs. Check out his Facebook page here or call him at 207-432-2900. * How about taking that old couch with the ragged threads to HEIRLOOMUP for updated upholstery? Visit Martha Livingston's new shop at 222 Main Street in the Village. She can help you with design and fabric choices and then do a fantastic job of bringing your favorite furniture back to life. And Martha can help spruce up your ripped boat seats. Call her at 207-595-1539. * HILLTOP HANDSPUN, located in North Lovell, Maine, is owned and operated by fiber artist and designer, Lucy Rogers. Lucy enjoys creating and selling hand made yarn to hand knitters and fiber and roving to hand spinners and felters. The yarn and spinning fibers are made from alpaca, mohair, wool and angora fleeces that she hand selects from Maine and New England fiber farms. Many of her designer yarns are hand spun and a number are spun at a local mini-mill often on a fleece by fleece basis. Beautiful colors in the yarns, which are inspired by the local mountain environment, come to life during the hand dyeing process in Lucy’s kitchen. Here is a link to Lucy’s webpage where you will find yarn and kits for sale. * LOVELL HARDWARE, located at 411 Main Street is up and running! Great selection of lumber, paint, nuts and bolts, mulch, pellets, pet and horse feed, propane and much more. Call 925-9053 for hours. * HOMESTEAD SCOOP. Beth Armington’s store sells much more than ice cream, coffee, hot dogs and stew! She also has two floors of local artisans’ work ranging from small crafts, iron pieces and quilts. A great spot for unique gifts at affordable prices. And don't forget that Homestead is an authorized United Parcel Service drop-off location. Stop in and visit. 207-925-9005. * PIETREE ORCHARD. Located on the top Waterford Road in Sweden, this Orchard is a great place to shop for local produce, baked goods, flowers, jams and pizza. The ‘Pick-Your-Own’ season is over but there is lots to choose from in the store. Visit PietreeOrchards.com for more detailed information. 207-647-9419. * KARL'S AUTO REPAIR, located at 118 Cushman Pond Road in Lovell. Get rid of that winter grime inside and out for your special person's car with an auto detailing package from Karl. Call for more details at 207-928-3132 or visit their Facebook page here. * How about some great handmade jewelry, bags, t-shirts, in addition to some honey and maple syrup? All from Justin and Jenn's 'off the grid' FLY AWAY FARM, a family operation in Stow. Visit their website here. Give them a call at 207-466-7352. * How about a Gift Certificate to some local eating establishments? 1)Rosie’s Lovell Village Store. Stop in or call Rosie at 207-925-1255. 2)The Center Lovell Market. Open on a year-round basis for great food, coffee, a bottle of wine and gasoline! Great pizzas! 925-3090-1051. 3)The Stow Corner Store. Original menu, great portions, a warm environment and a local institution! Check out their Facebook page here for updates on specials or call 207-697-2255. Don't miss the award-winning chili and seafood chowder! 4)The Wicked Good Store. Be sure to try out some great food at the new store in town! 207-925-9087 is their number and they are located at 360 Main Street. Visit their Facebook page here. 5)AJ’s Everything Store at 409 Maine Street in Stoneham. A small convenience store upfront and a nice restaurant out back. Great food at great prices! 207-928-2454. 6)THE CENTER LOVELL INN. The Inn offers 10 large comfortable guestrooms each appointed with family antiques and sitting areas for relaxing and reading. A full country breakfast is served piping hot each morning. Enjoy gourmet dining in a relaxed and friendly atmosphere in the evening. The forty-seat dining room offers a crackling fire on cold winter nights. In the summer, enjoy breakfast and dinner on the screened-in wrap-around porch. In the evening enjoy the sunset over the White Mountains. Visit the website here! 6)THE OLD SACO INN. Pete and Sandi welcome you to their pub, restaurant and inn on the banks of the Old Saco River. Good food and cocktails in a friendly setting. Great access to the snowmobile trails as well! Old Saco Inn. 7)‘Best Beer Bar in America‘, EBENEZER’s PUB During winter, it is an easy snowmobile ride to their front door. The Pub’s phone number is 207-925-3200. Still can’t figure out what to give to someone who has everything? How about a gift in their name to some of our local organizations? The Charlotte Hobbs Memorial Library, Lewis Dana Hill Memorial Library, Lovell Historical Society, Brick Church for the Performing Arts, Greater Lovell Land Trust, Kezar Lake Watershed Association, Lovell’s United Church of Christ or Lovell Friends Helping Friends (winter fuel assistance for the needy)! Please let me know of any additions to this list.